Red. Colour the selected text red. Blue. Colour the selected text blue. Green. Colour the selected text green. Gray. Colour the selected text gray. Black. Colour the selected text black. The the default text colour ($TextFont) is not black the default colour is applied. Highlight. Opens the Highlight sub-menu. Standard Size. Sets the selection to the default font size ($TextFontSize). If selected from View pane, the styling is applied to the whole text of the current note. From v7.5.0, a text selection is not required so a note with no $Text can be reset. Standard Font. 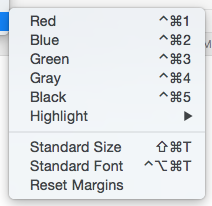 Sets the selection to the default font ($TextFont). Note that this destroys any bolding or italics as these are set using variant font faces. If selected from View pane the styling is applied to the whole text of the current note. Standard Font is more aggressive in removing indentation, background colours, text colours, embedded tables and list formatting. This is often what one wants when pasting from formatted sources such as Web pages. From v7.1.1, this now tries to respect passages that are bold or italic; it changes the font family to the note's default font family, using the note's text size. From v7.5.0, a text selection is not required so a note with no $Text can be reset. Reset Margins. This resets paragraphs in the selected range to use the standard margins and line spacing.